What with this, and the Sausage McMuffin, anyone would think I was opening my own gluten free McDonald’s! Sorry, I’m not, but we can make our own delicious “fast food” at home! Separate the eggs: put the whites aside in a small bowl, and the yolks into a bigger bowl. Add lemonade, vanilla essence, and oil to the egg yolks. Mix well, then add the flour, caster sugar, and baking powder. Whisk well to form a batter. Add the stiffened egg whites to the batter and whisk well. Fry dollops in egg rings over medium heat until bubbles form and the top starts to set. Flip over and fry for another minute or so. Nom with butter and/or honey! I’ve been in an eggy sort of mood lately. I just like eggs. 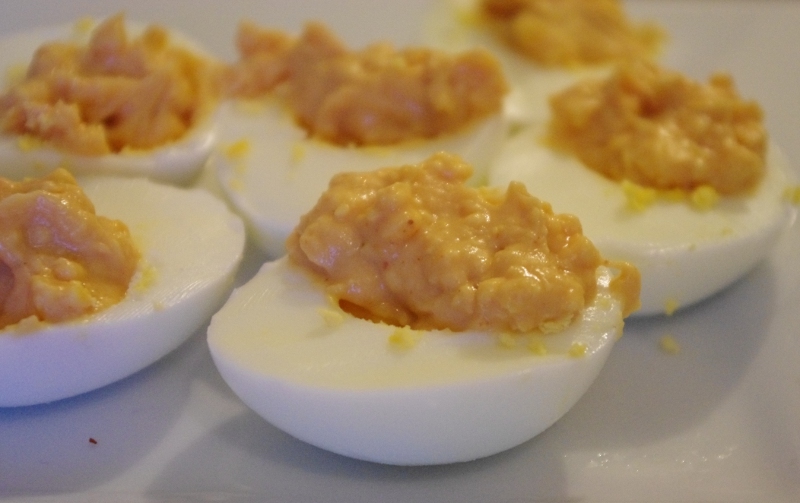 So when I kept stumbling across recipes for devilled eggs, which I’d never tried, they certainly made my mouth water. But they all seemed to call for mustard, which I don’t have in the house and forgot to buy last night! So I made my own really easy and yummy variation. Boil the eggs for thirteen minutes. Then rinse in cold water until they’re cool enough to handle comfortably. Peel eggs – this can be done easily by tapping all over each egg with the back of a spoon, crumbling the shell, so it pulls away nicely. Cut eggs in half lengthways, and scoop out the yolk of each egg. Mash the yolk in a bowl along with the mayo, sauce, and chili. Pop a spoonful of this mixture back into the hollow of each egg left by the yolk. Season with salt and/or pepper to taste. 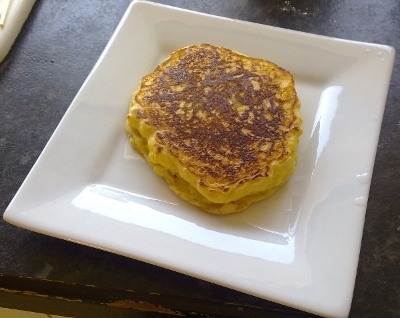 Gluten free crumpets are something I’ve wanted to try making for a long time, since I simply adore crumpets and miss them terribly. But for some reason the idea has always seemed very daunting, too difficult! Fortunately for me, I just stumbled across this recipe here, which I have reproduced here in a slightly more readable way (I hope). It is both simple and delicious! Even my gluten-eating husband was impressed. Put yeast in a small bowl with 1/4 cup of the water. Mix well and set aside. Put the flour, salt, and sugar (if using) into a larger mixing bowl. Add the rest of the water (1 1/4 cups) and mix well. Add the yeast mixture to the flour and mix well. Cover the bowl with a tea-towel and stand somewhere warm to rise. It should take 50-60 minutes and double in volume. 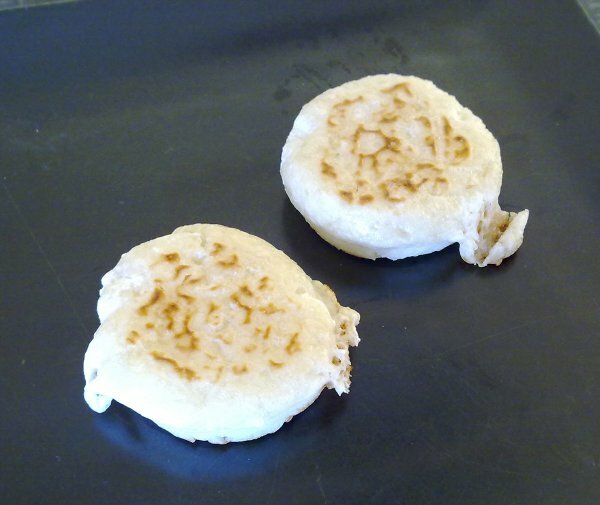 Fry for about 10-12 minutes, or until the top of each crumpet has bubbled and gone slightly dry. Then flip and fry for a minute or so on the other side, just to make it a bit crisp and golden. Serve with butter and honey (and without the egg rings). Nom! 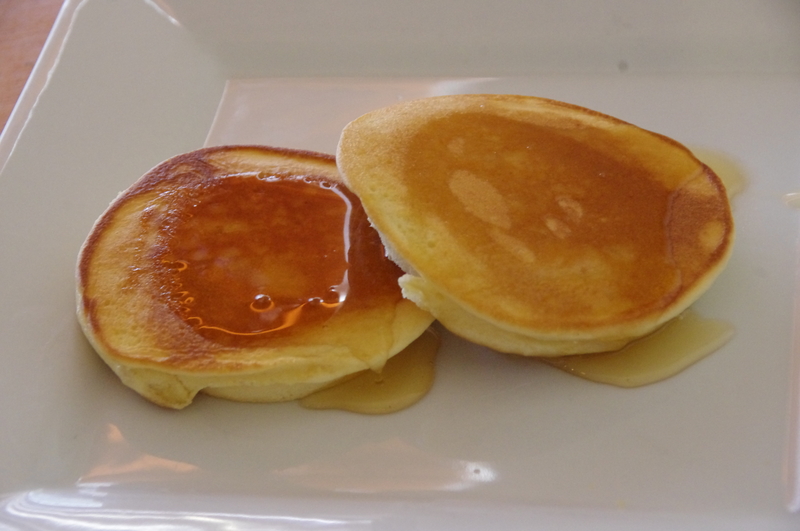 This is a great recipe which is quick and simple, suitable for breakfast, lunch, or a snack. I love these fritters, and so does Elspeth! Put all dry ingredients into a mixing bowl. Add corn and eggs, mix well. Fry dollops over medium heat, just a few minutes each side.